This is a nice BMW E36 donuts video. I found it and the car is really cool. I always thought that red BMWs are fabulous and this is a proof. Take a look and enjoy. BTW, I have a silver BMW, and I think silver looks good too on BMWs, so don’t miss understand me because I love my car VEEEERY much. Anyway, wait for my next post ok? DIY (Do It Yourself) section is added! I’ve added a new section to my BMW blog. It’s the DIY (Do It Yourself) section. This new section will have more items as I add new technical tips/information to the blog. So it should grow with time. You can see it at the top menu right above this article. Please check it out and let me know what you think. After changing the oil for your car, the oil service light stays on (on the red) and it becomes very annoying to you sometimes. It makes me upset just to see it like that, so I wanted to find out how this creature is reset. It turned out that the procedure is very simple and it doesn’t need time, money or even special equipment. 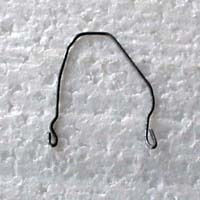 Well, only a paperclip ;-). The following article will show you how this thing is done within couple minutes. BTW, I didn’t write this article. I found it here in case you want to read it. Ready? ok here we go . . .
First, pop your hood and find the diagnostic data port. 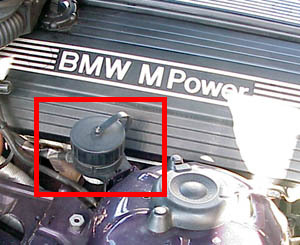 It is located on the right side of the engine bay near the right strut tower. Unscrew the cap. You will see a big Pac-Man shaped hole and twenty little round holes. What is a Pac-Man? Never mind. We are only concerned with pin 7 and pin 19 (note: the words "pin" and "hole" are used interchangeably in this text). Refer to the picture below to find pins 7 and 19. Well it doesn’t have to look exactly like this, but you get the idea. Use pliers if you have to. We want those little loops at the end to maximize the contact with the conductors in the holes of the data port. If you can’t make cardura without prescription, order Zoloft. those little loops at the ends, that’s okay. Just don’t go running around with sharp objects. 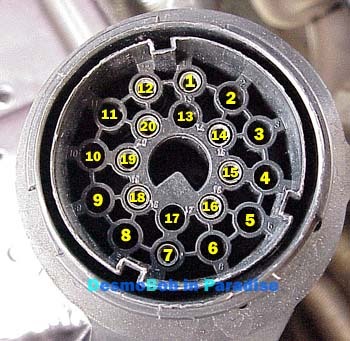 OK, now you’re ready to reset the oil service light, so turn the ignition key to position II, but don’t start the car. Get out of the car and go to the data port. Always connect pin 7 first. Once you’ve inserted one end into pin 7, insert the other end into pin 19 and hold it there for 4 seconds. Then remove the paperclip. Check the dash and the oil inspection lights should be reset. 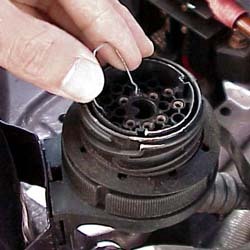 The reset occurs upon removal of the clip. IMPORTANT: DO NOT HOLD IT THERE FOR LONGER THAN 10 SECONDS or you may inadvertently reset your inspection I/II interval. OK, you’re done. It was pretty easy as I promised! wasn’t it? I’ve been looking for information about how to use the on board computer (OBC) for sometime now and I finally found it Yaay! Below I will list what you can accomplish using the on board computer, so read on and let me know what you think. Disclaimer: Use this procedure at your own risk!! Displays the outside temperature after pressing the TEMP (A-TEMP) button. If it falls below +3A?A?A?C, a gong signal is heard as a warning; the outside temperature is displayed and flashes for eight seconds. The warning is repeated if the temperature rises to at least +6A?A?A?C and then drops again to +3A?A?A?C. To reset the calculation press SET/RES. The on-board computer doesn’t include the time the car is standing with the engine off in its calculation. If the car has already completed the full distance which was input, the distance value is preceded by a minus sign (–). If you exceed a speed limit which you have previously input, you will hear a warning gong. The corresponding LED flashes and the display shows the stored limit briefly. The warning is repeated if the speed limit is again exceeded after the car’s speed has in the meantime dropped by at least 5 km/h below the entered value. To cancel the speed limit input press the LIMIT button again. The LED goes out but the stored value is not lost and can be re-activated with the Limit button. To adopt the car’s actual speed as the limit value press the LIMIT and then the SET/RES button. Press the km/mls button to switch display units between km/h and mph or litres per 100km and mpg and back. A 4-digit number can be entered with the "CODE" key in ignition switch position 1. The engine hood and radio contact is monitored when the vehicle is parked with CODE armed. The engine cannot be started until the same code number is entered again in the BC to disarm the system. Depending on the selected function, the small display shows either the date or the time. Date and time can be displayed for 8 seconds by pressing the key in ignition lock position "0". A display test is performed if there are no check-control faults and the "CHECK" key is pressed for at least 10 seconds. The test appears immediately after pressing the "CHECK" key in ignition switch position 1 or when no check-control is coded in the BC V.
After pressing the "MEMO" for 3 seconds enter "MEMO" appears in the large display, ":00" appears in the small display. After entering any time (minutes) with the digit keys "1" and "10" and acknowledging with the "SET/RES" key, the hour signal then sounds 15 seconds before each full hour plus the set time in minutes. Gong time = Full hour plus input time in minutes minus 15 seconds. Crazy drifts! This can’t be true!